This entry was posted in Arts, People, Restaurants, Saugatuck and tagged Jeff Kaufman, Jim Goodrich, Mina de Haas, Tutti's restaurant. Bookmark the permalink. I’ll be there for dinner soon, Tutti’s! I suggested to a friend, who works in a brokerage office at Nyala Farms, that they would do well to order Tutti’s take out for the entire staff. I don’t know if he took me up on the suggestion but others in Westport certainly could! I will be in the Westport/Norwalk area in a couple weeks. I will definitely stop by! Good job Dan, bringing this topic to the public! It’s great to see Westporters stepping up so quickly to help Tutti’s (mostly due to your post). 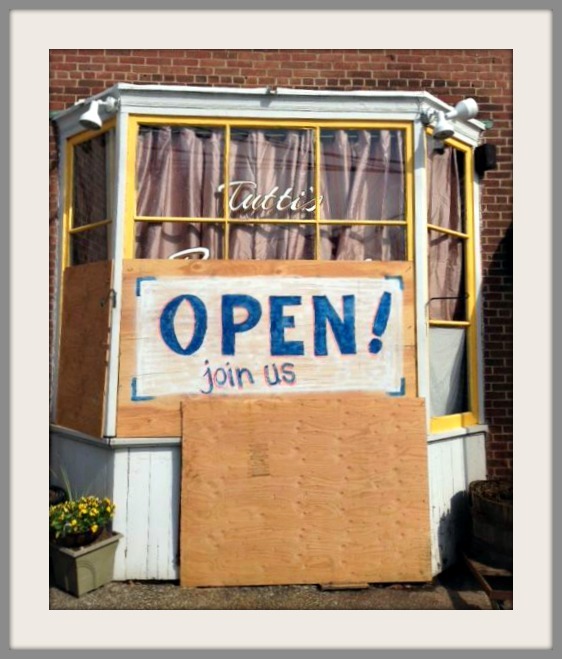 Wonder if a local print shop would consider making up/donating a banner that could really showcase the fact that they are indeed OPEN? (and perhaps cover up all the plywood at the same time). Hope they can bounce back and thrive – I love to see mom n pop eateries do well! They add to the “flavor” of our communities. I ordered from Tutti’s today. Great pizza and salad…and free local delivery! Thank you for all the love and support Westport has shown us thru this ordeal. We have wonderful customer’s, or should I say family. Thank you Westport. Rosita and I love Tutti’s. The Family Maria and Pasquale and their children are absolutely charming. We have been going there for years and many different occasions. Dan: I had Dinner last night with my daughter from 7:00PM and left about 8:30PM. A number of diners arrived during the same time, Tutti’s was busy. Food was great.